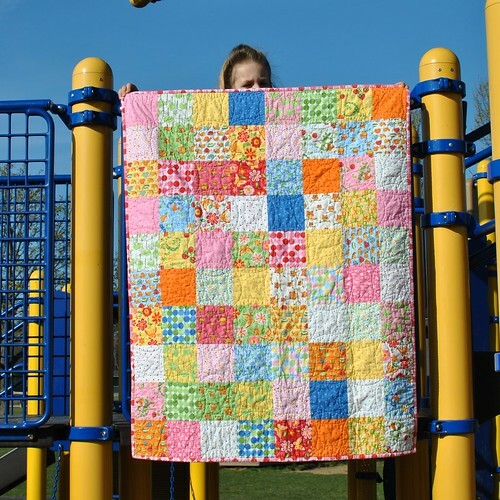 Love U Charm Quilt and Orange Peel Quilting Tips! I sewed up this simple charm square quilt for a college friend who is expecting her second baby, and the first girl! I had a few charm packs of Love U by Deb Strain for Moda in my stash, and while I was touring a few LQS here in New York I found two of the prints in a brushed cotton. I knew they'd be perfect for the binding and backing! Here are a few shots of the quilt. Keep scrolling if you'd like to know how I quilted the orange peel design! The brushed cotton on the back and the binding are so cuddly! 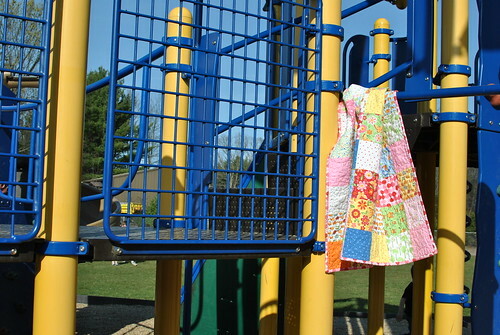 I love the bright colors of this quilt combined with the yellow and blue play structure! -I find that this technique works best when you have a base grid, such as in this simple charm quilt. 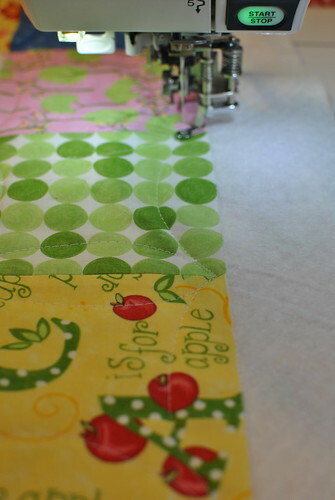 If your quilt has more detailed piecing, consider drawing a grid onto your quilt top using a water soluble marker, or whatever temporary marking tool you like best. 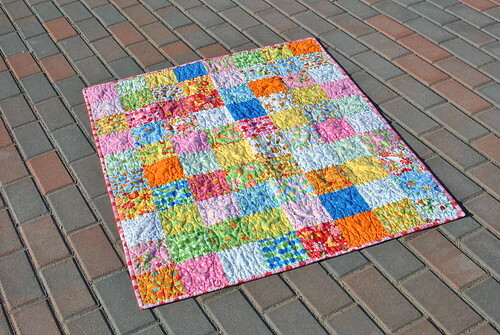 -I quilt this design with a free motion foot. I think it is a lot faster than trying to maneuver the curves with a walking foot. 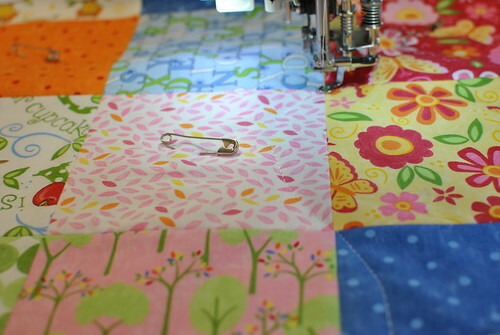 -Because this quilt style involves crossing over your quilting lines, be sure to baste extra carefully. 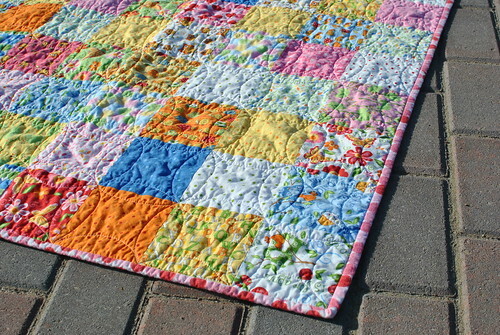 A poor basting job could result in a lot of puckers where the quilting lines intersect. -I like to begin in the center on one side of the quilt and work my way out. This will make more sense with the photos below. 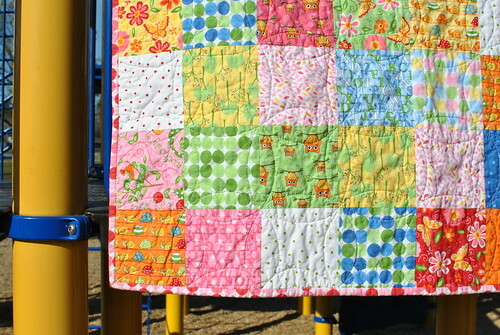 -And lastly, this is a technique that seemed the most natural to me when I wanted to try this quilting design. I'm sure I didn't "invent" it, and there are lots of other great tutorials and techniques out there. I don't want to step on anyone's toes, especially since this quilt style seems to be quite popular right now. I would just like to share what works before for me, in hopes that I can help someone else who would like to give the orange peel a shot! 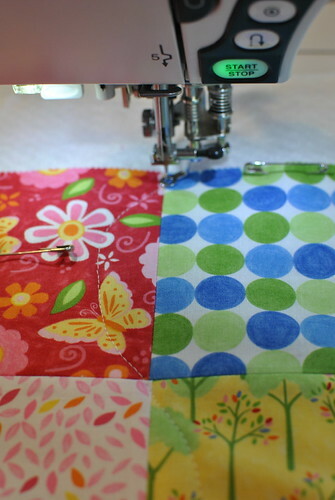 I am going to use the seams in my piecing as a guide in my quilting. Here I've started with a seam that is in the middle of one side of the quilt. I anchor my threads and begin about 1/4" in from the raw edge of the quilt. This ensures that the quilting isn't cut off when I add the binding! 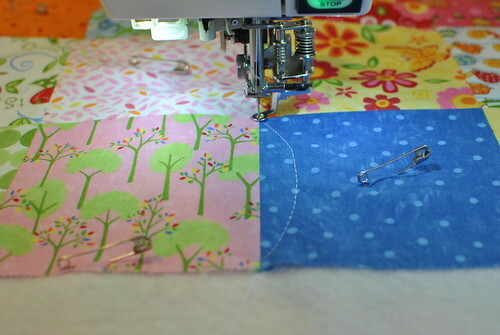 Now I'm going to sew a curve from my starting point to the next intersection in my piecing. 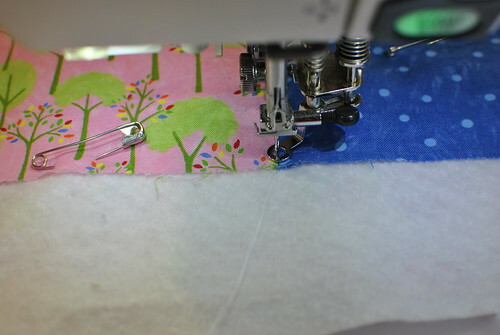 The key to this technique, and really any free motion quilting, is to become comfortable with starting and stopping your stitching lines. 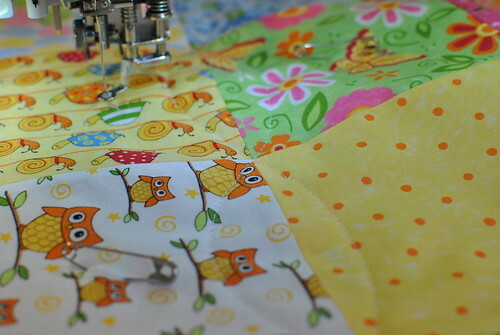 The smoother the start/stop transitions, the better the quilting will look! Now that I've quilted my first curve, I'm going to pause with my needle down in the quilt and reposition my hands to quilt the next curve. (Depending on the size of the grid that I'm quilting within, and my comfort level with the quilting technique, I don't stop at *every* intersection. But when in doubt, I like to pause and reposition my hands.) My first curve was on the right side of the seam line, so my next curve will be on the left side of the seam line, moving in the same direction. I continue to quilt the curves in this "serpentine" shape until I reach the end of the seam line. Always remembering to stop my stitching 1/4" before the quilt edge! When I have 1 row done, I continue quilting these rows of curved lines-but I don't want to quilt the outside edges quite yet. I like to work from the center to one end of the quilt and then begin again in the center and work out to the other edge. When all of the rows are quilted, I turn the quilt 90 degrees and do the same thing over! The overall design will begin to appear as I quilt perpendicular to my original rows. I continue working back and forth in the rows, and I'm always surprised to see the circular shapes appear in my quilting! I'm always starting and stopping my quilting lines 1/4" in from the raw edge of the quilt. 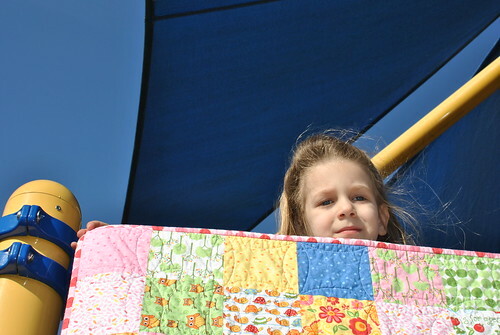 When all of the rows have been quilting, from top to bottom and side to side, it's time to quilt the edges. 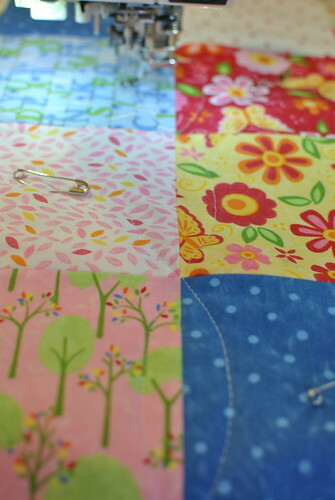 I like to do this last, because it is less likely to pucker once all of the other quilting is done. -Quilt all of the curves the same way, it will look more like a scallop than the serpentine curve that I quilted before. 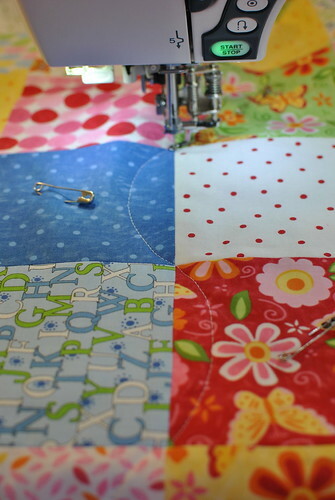 Here is a shot of the quilting on an edge of the quilt. Notice in the background that my machine is stopped about 1/4" inside of the raw edge of the quilt. 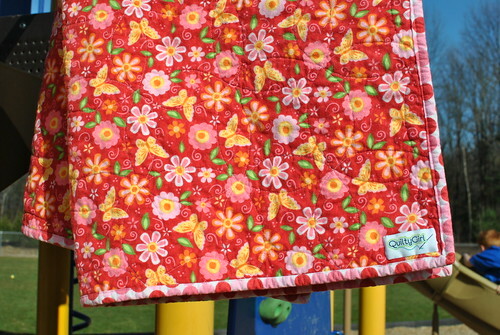 And here's another shot of the quilt edge. Once I have all 4 outer edges of my quilt finished, I'm done with the quilting! Now that I've taken you through the quilting, take another look at the quilt once it's bound and washed. I can promise you that many of my curves were slightly off, and my quilting lines didn't always line up quite right. But look at the fabulous circular effect! Now go try this out and tell me what you think! 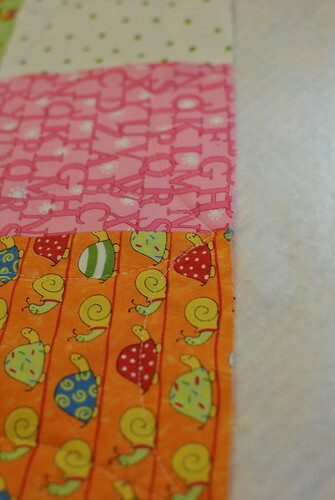 Next up, I think I'm going to try quilting the curves diagonally through my charm squares. I can't wait to see how that looks all quilted up!